As an Orange County portrait photographer we love capturing couples. Creating special portraits for your maternity session is a great way to remember this time in your life before the children are in the photos. Often times families bring their dogs as they are a big part of the family. 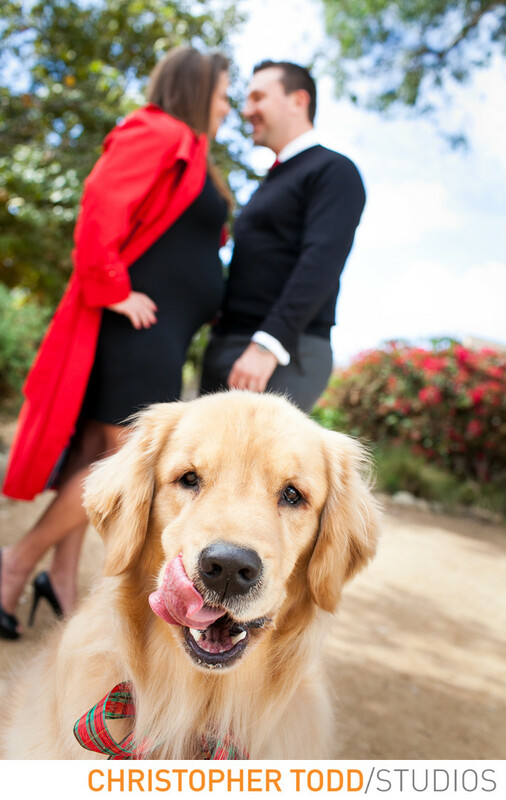 This photo of the couple in the background with their golden retriever wearing a holiday bow is perfect. The mom is wearing a black dress that shows off her baby bump and the dad is in a black sweater perfect outfits for a winter photo. These will make great holiday cards or gifts to parents and grandparents. Location: 18000 Goldenwest St, Huntington Beach, CA 92648. 1/200; f/4.5; ISO 125; 35.0 mm.